The roots of organized labor in Brazil as in most other Latin American countries, lies in the often forgotten realm of anarcho-syndicalism. Brought to life with the flood of immigrants around the turn of the century, Brazilian labor grew in the industrial cities along the coast. This radical movement which grew with the anarchist passion of Southern European immigrants and fanned by the repression of both church and state was the single largest force behind Brazilian labor for the first twenty-five years of its development. While the movement suffered harshly under the Vargas regime it retained its original strength but on a much smaller scale. Anarcho-syndicalists were still deeply involved in Brazilian labor until the nineteen thirties when worker-controlled labor suffered a slow death and the government took control of organized labor. Brazil underwent the full spectrum of development in its organized labor, from advocating worker control and anarchist organizing to authoritative and government controlled. This paper will show the influence that anarcho-syndicalism had on the growth of the Brazilian labor movement and how it was the most dominating force in Brazilian labor during the first quarter of the century of its formation until labor's decline in 1937. Brazil is a country of vast extremes. The story of labor in Brazil displays all the diversity of thought and action likely on the subject of organized labor. From one extreme of an anarchist controlled industrial labor force to the other a completely authoritarian government controlled labor bureaucracy. The story of organized labor in Brazil even at its height only represents a fraction of that countries population. In 1920, of the 30 million people living in Brazil only 250,000 were members of the anarchist unions at their height 1 While this is like a minority of the population Brazil's anarcho-syndicalist movement was the second largest in Latin America during the first quarter of the twentieth century. Brazil went through some important changes during the last decade of the nineteenth century. Slavery in Brazil was only abolished in 1888. In 1887 literacy in Brazil was still only at about 45% of the population. The majority of Brazilians during this period still lived in the country's vast interior. Everything changed around the turn of the century when massive immigration from Southern Europe took place and over 10 million Europeans entered South America from the 1870's until World War I. Out of that 10 million, 3,390,000 had entered Brazil between 1871-1920. Most of the immigrants arrived in the first decade of the century. This massive wave of immigrants combined with the growth of industrial Brazil lead to one of the worlds largest anarchist-controlled labor forces and helped shape the history of Brazil. This paper will detail the lives of those immigrants and, joined with the native Brazilians, the new land they created. The development of organized labor through various labor congresses and strikes will be studied in detail, as well as the influence of the ruling class, Catholic church, and the industrial workers themselves who controlled the world they lived in. All these things combined created this unique workers movement which made anarcho-syndicalism the most important force in organized labor both in Latin America and in Brazil for the first quarter of this century. Brazil was still primarily an agricultural country when it began to be flooded with immigrants around the turn of the century. Many immigrants were brought into Brazil to work the country's numerous coffee plantations. Unfortunately for the plantation owners many of the immigrants just kept on moving because they did not want to replace the slave labor force who had been freed only a few years before. One Italian journalist writing for the Italian Geographical society remarked that the plantation owners of Sao Paulo simply wanted to " replace black slaves for white ones". Many of these immigrants just kept on moving and finally settled in Brazil's two major industrial centers: Sao Paulo and Rio de Janeiro. Once immigrants started to arrive in the industrial cities they were shocked to find the crowded filthy conditions. In Sao Paulo poor working people were crammed into small rooms averaging 10 by 10 by 18 feet, often with four to six people in each room. The sanitary conditions were just as deplorable, the poorest 15% of Sao Paulo was forced to share one toilet for twenty people. The poorest 10% had to share one toilet for every one hundred to two hundred people. Industrially Brazil slowly grew as a textile center for South America. The port cities of Santos and Rio de Janeiro shipped much of Brazil's coffee and rubber overseas to European and American markets. Brazil's ruling class still operated as if they were in a slave economy demanding sun-up to sun-down labor; both in the fields and in the factories. The popular opinion that the ruling class shared about class division in their society was to completely deny it. Rodriques Alves, the president of Sao Paulo, when asked about class division in Brazil stated, " among us (Brazilians) there is frank democracy and a complete absence of social classes". With a developing industrial economy and a massive interior filled with natural resources, Brazil was making itself one of South America's leading economic centers. Brazil, although it was growing slowly, remained a minor industrial center on a global scale till World War I came about and Brazil was cut off from its trading partners. As a result it was forced to develop itself industrially to make up for what could not be imported from Europe or America. This can be seen in the startling growth of Brazil's leading city at the time, Sao Paulo. In 1900 Sao Paulo had 239,820 people and 22,407 buildings, in 1918 the population and buildings doubled to 504,278 and 55, 256 respectively. But industry and government were corrupt organizations who served only the interests of those in power. Newly arrived immigrants saw this decadent system based on human exploitation and violence and rejected the whole system as beyond redemption, in this belief lies the popularity of anarchism for Brazil's immigrant working class. In the words of historian Fanny Simon, " Fraud, violence and control by landed oligarchs were the rule in South America. Many workers accordingly, came to believe that direct rather that political action was the only way to improve their status." Organized labor as well as the growth of urban Brazil begins with the massive wave of immigration that changed the whole world during the first half of the twentieth century. Throughout its history Brazil has long suffered an identity problem. The capitalists who ran the factories and plantations preferred immigrant labor over that of the Brazilians. They considered anything European to be superior over anything Brazilian; Brazilian workers included. Of the 3,390,000 immigrants who flooded into Brazil the majority were from Italy (1,373,000), the Portuguese made up the second largest group (901,000), Spanish immigrants were numerous as well (500,000). German, Polish, Jewish, Russian and Danish immigrants all moved to Brazil is less sizable numbers. By far the majority of the Italian immigrants hailed from the country and cities of Northern Italy where a firm labor tradition had been in place for a generation. As mentioned earlier many of the immigrants skipped the cities and moved into the countryside to find horrible conditions: trachoma alone infected 305,000 people in 1905 on coffee plantations in rural Sao Paulo. Besides the European immigrants flooding into the cities, Brazilians were often forced by the decline of Brazilian sugar on the global markets to move from the Northern regions to the urban centers of the south. Overwhelmingly, it was immigrants who made up the industrial and urban work forces and it was they who were the force behind the growing anarcho-syndicalist movement in Brazil. Anarchism was the favored political ideology of the immigrants for a variety of reasons. While it was definitely a response to the harsh treatment handed down from Brazil's ruling class, it consisted of much more than simply a reaction to cruelty. One of the reasons for the popularity of anarchism was that few immigrants had any desire to become citizens. In 1920, only 6,441 or 1.45% of the 444,374 foreigners in Sao Paulo and Rio de Janeiro had become Brazilian citizens. The Brazilian immigrant therefore existed outside of the traditional political system. Government was something removed to them, something distant. Anarchism was the only political philosophy that actually encouraged its supporters to live outside of the traditional political spectrum. Socialist and reform parties in Brazil always encouraged its followers to become citizens, register to vote and elect them into positions of power; anarchism makes no such requests to its adherents. It was the relative few demands that anarchism prescribed from its followers that made it so popular. Anarchism simply asked for less from the workers than other political parties of the time. Anarchism was also popular to the immigrant because many had wished to escape the rigid 'hierarchical structures' and control that was prevalent in so many Southern European communities. To them Brazil represented a new world with the possibility to free themselves from the restraints of the old. Anarchism was also a strong political force in Southern Europe, with thousands of followers in both urban and rural Europe. One thing that almost all immigrants to Brazil shared in common was a Catholic background. While the immigrants may not have hailed from a personally religious background the society they left as well as they society they entered was dominantly Catholic. The anarchists who organized Brazil's labor movement had a delicate relationship with Catholicism. Immigrant workers drawn to anarchism in Brazil realized the hypocrisy of the church's action; but at the same time yearned for fierce moral guidelines. This is truer are of the anarchists who took on the role of organizers rather than the rank and file members of anarchist unions. Anarchist labor organizers in Brazil followed a strict code of conducting themselves, as many opposed all forms of alcohol, tobacco, and the eating of meat. The anarchists in Brazil fiercely attacked the church on many issue's including the Church's refusal to promote or acknowledge any form of birth control. Brazilian anarchists thrashed the Catholic Church for allowing such madness as Carnival claiming it was a waste of human life. In the words of one critic writing in A terra livre, " Carnival is over, and what is left ? Squeezed buttocks and breasts and other lovely things". To anarchists who were trying to organize Brazils poor, Carnival was a distraction for the poor so that they could forget about their miserable lot in life in a decadent display of drinking and other unseemly behavior. Anarchist labor organizers would cite the same distaste for any diversion created as a chance for the workers to temporally rise above their misery. Alcohol was the chief cultural enemy of the anarchists, but anything that diverted the poor was open to attack: tobacco, cinema, and soccer. The anarchists begged the poor of Brazil not to wait for eternal redemption while living their lives in utter misery and poverty; but to grasp the situation and take control of their destiny. They charged that the Church was content to let the poor suffer, content to allow them to be merely passive observers in their own lives. For these diehard activists spreading the word of workers rights and anarchism was the same as spreading the word of a religion. Interestingly enough one of the favorite topics among anarchist was; Was Jesus Christ an anarchist ? These anarchists’ activists considered themselves closer to Christ's message than the Catholics. Closer to his personality and to his predicament of one man against an empire. When militant labor organizers went out to the poor to speak of workers rights and the great division between rich and poor they present their views just as Christians would. The evangelical spirit and the conversion experience were two traits that militant anarchists shared with Christian missionaries and preachers. What the anarchists opposed with all their strength, down to their last breath, was the horrible hypocrisy of the Church. A betrayal of the Church to its own message, of authority and hierarchy covered up in the illusion of a world for the meek. Traditionally, many historians have simplified the anarchist experience in Brazil and all of South America by simply stating that anarchism was very popular among the poor of Southern Europe, and that it was simply imported with the immigrants. When the immigrants arrived in South America they simply tried to recreate their old world in every way and that included their political affiliations. The Brazilian anarchist experience was far more complex than that quick equation. As historian Sheldon Maram suggested anarchism flourished in Brazil because not because it was imported with all other Southern European characteristics but because it was the movement most attuned to the situation in Brazil. This is a major theme in the development of the anarcho-syndicalist movement in Brazil, that anarchism was the only political philosophy capable of uniting Brazil's immigrants and serving the organized labor needs at the same time. The very first people to organize themselves into unions in Brazil were not industrialists or factory workers but artisans and skilled workers. It was their fierce independent spirit of the artisan the flamed the fires of anarchist organizing among Brazil's working class, " Anarchism drew its early strength from the artisan. Who valued self-teaching and individual enterprise and therefore saw a rise in industry a threat to his way of life ". It was in this immigrant population that Brazil's most active anarchists dwelled. One of Brazil's most active fields and areas for anarchist action was the stonecutters of Greater Sao Paulo. Stone cutting by its very nature was an independent activity. Stonecutters were not paid a wage, they profited in small groups of workers and got paid on the delivery of finished products; they needed neither the government nor the employer. By their positions as skilled workers who could not be easily replaced when they struck or withdrew their labor over an issue immediate action would be taken to remedy the problem by the people the stonecutters worked for. In this sense 'direct action' as a political philosophy made sense to them. In contrast factory workers because of the nature of their work and the ease of replacing the work force were often subjected to longer more drawn out strikes. There was often tension among Brazils diverse population in this era. Among the Italians and Portuguese the labor movement was often divided among the different races. Language was the chief barrier as most labor publications and radical newspapers in Brazils up until 1920 were published in Italian. Union’s locals, were often divided by language. Only minor conflicts arose between the European immigrants. The serious divisions among races in Brazil took place between native Brazilians and Afro-Brazilians and the massive immigrant populations. Immigrants constantly complained that the Brazilians had no class conscious and no passion for working class issues. Often the Brazilians would be used as 'scabs' to break up immigrant strikes. In the world of organized labor a person who turns their back on his fellow workers and agrees to replace a striking worker in considered the lowest form of human scum. This division created by the employing class in Brazil created a huge gulf between these two populations. This tensions over Brazilians (often blacks) crossing immigrant picket lines created distrust and hate between these two groups that otherwise would of shared many things in common. Afro-Brazilians did organize themselves into political groups but these groups most often focused on racial politics rather than labor issues. Occasionally an Afro-Brazilian group would form a 'socialist' organization like the Brasil Novo newspaper that was founded by a black lawyer Gurana Santana in 1932. Immigrants often charged that Brazilians had no working class traditions to draw on. While the Brazilians may not of had a specific working class tradition to draw on many anarchists were impressed with the inhabitants of rural Brazil ability to exist peacefully with very little government interference. Oreste Ristori, a famous Brazilian anarchist writing for a Geneva newspaper wrote that, " Whole areas of Brazil are free of government, one could travel for weeks, even months..without seeing a policemen...that the law everyone respected was work." The diverse anarchists of Brazil sponsored and took part in many activities besides the labor movement. Brazil was particularly well known for instituting Fransico Ferrer Free Schools. Francisco Ferrer was an internationally known anarchist educator who was murdered in his homeland by Spanish officials for criticizing the Catholic Church as an educational institution. Free Schools were anarchist run institutions built on learning, through free exploration of ideas rather than forced information. Besides education, the anarchist was often at the cultural forefront of Brazil. They were the only group that tried to bring plays to the poor working class. They also published literary works not related to politics in their newspapers, like A terra livre. They always organized celebrations and festivals on the traditional anarchist holidays, like May 1, November 11, and March 18. Anarchism was not a simple one-sided political philosophy but rather a complex ideology with a diverse movement in Brazil. The anarchists did not break out of their political isolation until 1902 when many started to take an active interest in the development of trade unions. The first major strike in Brazil occurred in Rio de Janeiro in 1903 when workers at the Aliaca Textile Mill walked off the job. This strike paralyzed Rio de Janeiro for twenty days when over 40,000 workers from all the city’s textile mills went on strike demanding better conditions and pay. Most strikers did not win but instead they settled for a nine and a half hour workday. The first Brazilian Labor Congress was held in 1906. The major event of this congress was the founding of the Congresso Operario Brasileria (C.O.B. ), this new labor system was based on anarcho-syndicalism. The system of organization the Congress endorsed was the federation system where unions were held in loose associations but retained their individual autonomy. This federation system was directly based on the radical French anarcho-syndicalist union the Confederation Generale du Travail (C.G.T.). In the anarchist federation system there exists no paid officials, only temporary officers and no official leaders. Many of the workers in urban Brazil were actually not industrial workers but instead worked in the cities extensive service industries. It was just these type of workers who struck in 1906, at the Compahia Paulista Railroad. The government reacted quickly to an anarchist lead strike that threatened Brazils transportation network; immediately the government sent 500 troops to break up the strike. Attorneys who tried to help strikers were arrested and the government stopped all telegraph service in all areas around the strikers. Next, the government went to the company housing that they provided railroad workers and started kicking families out of their homes. The government and the Catholic Church did not know how to handle their urban poor striking. Catholic leaders sent letters to the strikers asking them to call off the strike; but even the urgings of the church could stop the strikers. The real reaction came when workers in Santos threatened a sympathy strike. The immediate reaction of the government was to send to warships to that port city. Leaders in government and industry had good reason to fear a sympathy strike in Santos. As Santos was regarded as Brazil's most radical city it earned the nickname 'little Barcelona'. The C.O.B., one of Brazil’s leading anarchist labor organizations always had higher membership numbers in Santos. In 1907, shortly after the C.O.B. was created Santos had Brazil's highest concentration of organized labor and four times the members of Rio de Janeiro unions (22,500 in Santo to 5,000 in Rio de Janeiro and 12,500 in Sao Paulo). Santos had the highest concentration of anarcho-syndicalists in Brazil for several reasons. Since the city served as a port and satellite city for Sao Paulo it consisted of very little industry. The residents of Santos were highly skilled laborers compared to Brazils other major cities. Working in a port city provided for constant interaction with anarchist, socialists, and communists who were arriving from Europe and other South American countries. Santos tended to be a city of single men in the anarchist movement. Men with families were more likely to live in the larger cities of Sao Paulo or Rio de Janeiro. A work force of single men without the burden of families is going to have the flexibility to take more chances and less fear of the consequences of direct action than men who had to support a family. In this respect, Santos shared more things in common with the huge anarchist movement in Argentina where families were rare as the concentration to men over women was greater. The next strike to shake Brazil was a general strike in the textile industry of Sao Paulo in 1907, it was a short unsuccessful strike. After the enthusiasm of 1906 and 1907 Brazilian labor went into a bit of a lull and little activity took place. The anarchists continued to publish their newspapers and organize their free schools but little labor activity took place until the massive resurgence of 1912. While labor activity slowed down for about five years between 1907 and 1912 the seeds for further revolt were being planted in the minds of the workers. During this time Brazils leading anarchist paper A terre livre published seventy five issues and kept a weekly readership averaging around 4,000. The paper was being recognized on an international scale when Peter Kropokin the famous Russian anarchist wrote to the paper thanking them for a donation to the Russian anarchist movement and publishing a fine newspaper. This lull in labor activity fit right into the anarchist plan for organizing. Their pattern was for years organizers would spread propaganda among the workers. When unrest happened on the labor agitators would organize a union for a strike. If the strike was successful than the union was kept; if the strike failed then so did the union. This was the pattern of labor organizing that anarchists employed all throughout the 1910s and 1920s. The C.O.B. was not the only labor organization attracting workers along anarchist lines the Workers Federation of Sao Paulo (F.O.S.P.) was very militant among many fields between 1908 and 1912 especially among construction workers in Sao Paulo. These construction workers like the stone cutters of Sao Paulo were very aggressive in their demands and their actions. One strike in Rio Grande do Saul, which was led by that cities Federacao Operaria Syndiacal by 1913 this group which had its headquarters in Porte Alegre which represented 42% of all the federations members. Textile workers had always been considered hard to organize for the Brazilian anarchists because in 1911, for example 72% of all textile workers in Sao Paulo were women and children. These textile workers were not all together cautious though they probably just seemed harder to organize because there were so many textile factories. Between 1901 and 1914, twenty six of the seventy five strikes in Sao Paulo somehow involved textile workers. In general though labor was considered to be in a decline between 1908 and 1912. The resurgence was strong when in 1912 anarcho-syndicalist unions represented over 60,000 workers in Brazil. This new wave of unionization carried Brazil towards its second national labor congress which took place in Rio de Janeiro in 1913. The themes for this congress where simple shorter hours, better pay, and safe work conditions. 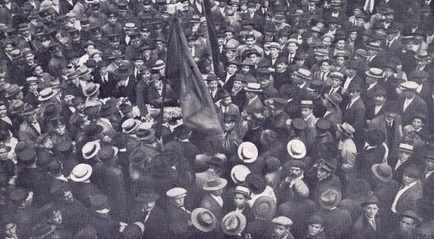 Anarchists from all over South America attended the 1913 labor congress and many were impressed with the Santos Labor Federations plan to recruit members strictly along anarchist lines. Brazil experienced a depression in 1913 and 1914 but the labor movement only slowed slightly. In 1915, Rio de Janeiro hosted an international South American anarcho-syndicalist conference with delegates attending from: Argentina, Chile, Uruguay and five Brazilian States. The major themes for this conference was building an anti-war movement to oppose the war in Europe. Brazil was unique in that it maintained a large and often stable organized labor force capable of conducting numerous strikes; while at the same time constantly having a surplus of labor. This may prove more toward the racism of the Brazilian ruling class than the solidity of the working class as the ruling class preferred to pay European immigrant women and children to work than use the countries massive Afro-Brazilian population. Industrial employers on the whole considered blacks to be fit for menial labor only as they were considered inferior to Europeans. The years 1917 through 1920 represent the height of Brazil's worker led labor movement. The winter of 1917 is considered one of South America's most impressive displays of human solidarity and radical labor activities. In these years Brazil's anarcho-syndicalist movement would ignite like a fresh struck match. Then just a quickly as the match ignited, the flame would burn the match until only a smolder of what was before remains. Brazil's labor unrest was ignited not by political ambitions but instead by the ambitions of bread. In 1916 and the first part of 1917, Brazil was experiencing a huge increase in the cost of living in food and fuel prices. This rise was dramatic and combined with non-increases in wages and the populations of industrial cities like Sao Paulo and Rio de Janeiro were not happy. Any attempt to better conditions or pay was quickly turned down. In June of 1917 workers at the Contonficio Crespi plant in the Mocca district of Sao Paulo asked for a 25% wage increase; although business was booming their request was turned down. Unions like the F.O.S.P. who started 1917 with membership around 30,000; organized rallies to protest the high cost of living. At one such of these rallies on July 11, a common worker who had no connection with the rally, Antonio Martinez, was beaten to death by Sao Paulo police. Sao Paulo erupted in shock at the brutal death of a 21 year old worker. Antonio Martinez's funeral was a massive event. The funeral procession marched throughout the city and at one point the police confronted the mourners. After a shuffle the police began to attack the crowds. Police on horseback attacked one portion of the processional with swords. The result of this was massive unrest and rioting in Sao Paulo. The next day, July 12, 15,000 workers walked out on strike. The day after another 5,000 workers joined the strike. Soon a general strike was declared and the city was at a standstill. The government declared martial law and brought in the army. The main cause behind all the strikes was the high cost of food and the brutal death of Martinez was just the catalyst. Eventually, the strike ended when the government put pressure on the industrialists to end the strike; the workers settled for a 10% wage increase. Sao Paulo was actually just the begging to the strikes of 1917. News of the unrest was not slow to reach Rio de Janeiro. When descriptions of the strikes reached one furniture worker on the morning of July 18, he immediately walked off the job calling for a strike at his factory; two others workers joined him. By the afternoon of July 18, only 150 workers had walked out in solidarity with the strikers of Sao Paulo. On July 19, five factories were on strike and the movement was growing uncontrollably. On July 22, the F.O.S.P. of Rio de Janeiro called for a general strike. To their surprise 50,000 workers went on strike on the morning of July 23. Later in the afternoon of July 23, 20,000 metal workers walked out in solidarity with the factory workers. The demands for all the workers were universal; an eight hour work day and a 20% wage increase. This was a textbook spontaneous general strike and all of industrial Brazil was stopped and in control of the workers. The reaction of the government was swift and severe. By July 26, the government had used all its resources and declared martial law. Army, navy, and police were guarding all the major areas of Rio de Janeiro. The strike carried on into August when the government finally realized they could not keep control of a whole population. The government soon forced the leaders of industry to settle with the workers. On August 2, 1917 the Rio de Janeiro general strike ended with the workers settling for a fifty six hour work week and a 10% wage increase. In a few short months Brazilian labor had shown its incredible strength and power. The workers displayed that they were powerful enough to call strikes on a national scale. The organization and influence of the anarchist played an important role in the speed by which union leaders called strikes. Traditional reform unions have always been slow to call strikes preferring long meeting with employers and drawn out negotiations. The anarchist leadership of the F.O.S.P. knew the pulse and passions of the workers and had the good sense and timing to know when to call the strike at a time when they knew they could get massive workers support. The government too was impressed with the actions of the anarchists and the realized that they had a problem with their labor unions. In September 1917, in response to open German bombing to Brazilian merchant shipping the South Atlantic, Brazil entered the war against the Germans. While Brazil had entered the war near its end and they played a very small role the Brazilian government used the war as an opportunity to solve their domestic labor problems. The Brazilian government declared that the strikes of July and August were the work of German and Italian agitators who had the backing of their respective governments to cause unrest in Brazil. The response was the deportation of hundreds of labor leaders, the closing down of labor newspapers and the threatened deportation of anyone professing leading labor activity in the July and August strikes. This was a devastating blow to the labor movement that had just made so much progress with the workers. The labor forces of industrial Brazil was at this time still mostly immigrant and most often these immigrants’ worst fear was being deported from Brazil. 1917 was the height of anarcho-syndicalism in Brazil. As a result of the general strikes the industrial employers and the government realized they had a common goal in the destruction of the anarcho-syndicalist unions. The government used World War I as an excuse to tear apart the leadership of the anarcho-syndicalist unions but they needed a bigger event to give them an excuse for more repressive deportations and a public crackdown of the radicals. The attempted revolt of 1918 signalled the decline of anarcho-syndicalism in Brazil. The world at this time was a place of great change and social unrest. The standard Marxist notion that capitalism would be destroyed and a new world would arise was a commonly held sentiment at the time. Workers truly believed that the great socialist revolution was a just about upon them and why would they have any reason to doubt that notion. The whole world at his time was in a great state of revolution as socialist movements were alive in every industrial country on the earth. When the news of the Russian Revolution first reached Brazil; anarchists were ecstatic. Radicals of all sorts were convinced that the Russian Revolution had spread farther and was much more utopian that was being described to them by the capitalist press. It was a commonly held belief among radicals everywhere that it would be only a short time to a revolution came to a town near them. It was with thoughts like these in their heads that a group of anarchist labor leaders planned the overthrow on Rio de Janeiro and eventually the whole Brazilian state. With the exception of this incident (which as we will see never got off the ground) Brazilian anarchism was an incredibly peaceful movement. Bomb throwing were almost unheard of as the Brazilian anarchists did very little to live up the phantom notion of the violent lone anarchist bomb thrower. The 1918 revolt was being planned by a group of forty anarchist labor leaders who met in one of the classrooms of one the group’s leaders. The group had a considerable plan and arsenal for their attack. They had gathered 1,600 bombs, a detailed plan with people in all the key positions of the city: power, radio, telegraphs, and transportation. They also had over 40 barrels of gasoline ready to burn down the key structures of government the city hall, police station, and banks. Also included in their portfolio was an small army of 4,000 militant anarchists union members who were ready for street battles with the authorities. The group’s plan was to take over the city and lead the workers to a general strike that would shut down industry which then would fall under worker control. The plan actually never got a shot to be put into action because one of the men attending the organizational meetings was an informant for the Rio de Janeiro police. The only results were massive arrests and deportations of all involved and some small instances of street fighting. The majority of the labor movement and the majority of the anarchists never had any knowledge of the plan but they certainly felt the repression that followed as this incident gave the Brazilian government full authority to persecute those in the anarchist and labor movements. Actions like this attempted revolt were a direct result of the Russian revolution which had a enormous effect on the radical labor movement in Brazil. 1919 was an important year in the development of Brazilian labor. 1919 signaled the turning point in Brazilian labor history when control of organized labor shifted from the anarcho-syndicalist to the reformist unions. The year consisted of many strikes and for the first time the strikes to place in different regions of Brazil. Bahia, Pernambugo, and Rio Grande do Sul as well as Sao Paulo, Rio de Janeiro and Santos all had consistent labor activity. 1919, was the first year that Brazil enacted a workers compensation law. As the anarchists would be fond of pointing out the government could create all the laws they wanted to because it made no difference in the lives of the workers; as this labor law was the quickly ignored Brazil's employing class. The first major strike of 1919 took place in early May and sections of it lasted until June and July. It is important to note that even during a general strike not all workers would be out on strike. Workers would often strike a few days then return to the job as another factory or section of the factory went out on strike. This tactic frustrated the anarchist labor leader's who saw it as a determent to achieving the end result. The simple truth was the often times were just too tough in Brazil and common workers did not have the savings to support themselves during a long strike. It seem of confusing way to conduct of strike but these were unsettling times in Brazil. Organized labor in Brazil was considered at this time still very radical by global standards. A delegate from Brazil that traveled to a world labor congress in Europe reported that Brazilian syndicalism was not plagued by ' Socialists Parliamentary Illusions'. In others words anarcho-syndicalism in Brazil was still a revolutionary and not a reform organization. On May Day 1919, in Sao Paulo an anarchist rally attracted 60,000 workers who spent the day listening to revolutionary speeches. One month latter, 20,000 factory workers struck in Sao Paulo. Around the same time as the May Day rally in Sao Paulo another massive strike was brewing in Rio de Janeiro. Finally on the 4th of May 1919, 50,000 factory workers went out on strike in Rio de Janeiro. Their demands were the same as always an eight hour work day and a 20% pay increase. Both the Rio de Janeiro and the Sao Paulo strikes lingered on well into June and July and the government was starting to get serious about Brazil's growing urban labor problem. During this time the Catholic Church displayed which side they were on. One Catholic center in Sao Paulo begged the workers to be peaceful and give, " Unrestricted support to all conservative classes in the present emergency and (to) declare themselves at the side of the government for the repression of anarchism". With the government finally forcing the hand of the industrialists the strikers in Sao Paulo and Rio de Janeiro won an eight hour day and a 20% wage increase. It was a short lived victory as the trade off for the shorter hours and pay increase was that workers had to give up their unions. An organization Centro Indsutrial de Fiacao e Tecelegem de Aldgodai, was set up to mediate the strikes they were a composition of half workers and half employers, they made the decision to drop the unions. Shortly after the workers in Sao Paulo lost the unions their new victories from the strike slowly started to wither away and in some of the same factories that struck conditions reverted to pre-strike within a year. This was the first time that the anarchist started to loose their control over Brazilian labor. Brazil at the same time was getting serious about the anarchist threat and in September of 1919, Brazil signed a pact with Uruguay, Argentina and Paraguay to rid themselves of their mutual anarchist enemies. This was a direct result of an international labor congress in 1919 that called for the formation of the South American Syndical International, a conference that Brazilian delegate took an active role in. Almost immediately the arrests and deportations started. Newspapers and the offices of anarchist lead labor unions were trashed, labor leaders were beaten and killed. The rebellious workers of Santos took instant action. In mid-October 1919 strikers from Santos were arrested as part of the repression of labor activity. Leaders at the F.O.S.P. called for an immediate general strike on October 20, to protest the arrests of strikers in Santos. Only four factories took part, and the general strike was over before it had a chance to begin it was considered a complete disaster for the F.O.S.P. The amazing instincts of the anarchist labor leaders in 1917 were missing now as the Brazilian workers were not in a desperate food shortage and would not rise up solely for political reasons. Unfortunately for the anarchists the failed Santos general strike started a self destructing pattern for the anarchist labor unions. The exact same thing happened again when a general strike was called in 1920 for factory workers in Rio de Janeiro and the workers did not arise. This pattern of failed general strikes would the most important cause of the slow decline of anarcho-syndicalism in Brazil. Industrial Brazil was getting more concentrated. In 1920, Rio de Janeiro 17,641 out of the 19,924 textile workers labored in factories employing more than 100, 14,090 worked in factories that employed more than 1,000. The situation was similar in Sao Paulo were in large factories employers had gotten better at spotting agitators and removing them before trouble started. At the third Brazilian labor congress in 1920, the congress formed the Comussao Executova do Terceiro Congresso which tried to do away with the C.O.B. At this congress the delegates also voted unanimously to condemn an international labor congress that was to be held in Washington DC because the employers and governments were allowed to choose the delegates for the congress. This congress showed a slow decline in anarchist sentiment and the growth in the popularity of communism. 1921, saw another failed general strike in Rio de Janeiro where maritime workers were on strike. The government was now all too prepared for the anarchist predictable pattern of striking and union organizing. Before a movement could get started they would step in and arrest all the labor leaders and most often deport them. Anarchist activity slowed considerably during the 1920's for a number of reasons. Anarcho-syndicalism became a more concentrated movement not reaching the large numbers it did earlier but still keeping control over a number of unions if different parts of Brazil. One well known Brazilian labor leader was Jose Righetti, a weaver and an anarchist who founded the Textiles Workers' Union on April 14, 1924. During this time the loose nature of the anarchist organization allowed this Textile Workers' union to build ties to a number of community organization. This came in helpful in July 1924, when a group of dissident military officers took over Sao Paulo as a coup against the government in Rio de Janeiro. During July 5-28, this military coup ran the city and kept Sao Paulo in a state of siege. 1,000 Paulistanos were dead and 4,000 more wounded in bombing and shelling; another 300,000 fled into the interior around Sao Paulo. In desperation, lead by Jose Righetti, people from all over Sao Paulo raided food warehouses in Bras and Mooca. Bringing the anarchists again a surge of popularity for their leadership and skills in direct actions and times of crisis. Once order was restored the government blamed much of the chaos in Sao Paulo on the anarchists. This was cause for even more repression as dozens of labor leaders and anarchists not associated with the anarchist movement were banished to rural prisons and labor colonies near the French Guinea Border. 1925 saw more labor laws passed by the Brazilian government. This new law tried to enforce a two week vacation for workers and put down on child labor. As is often the case with labor laws a chasm exist between the law and what is enforced. Another major factor in the decline of anarcho-syndicalism in Brazil was that the focus of anarchists shifted from labor to other concerns like fascism. The late 1920s saw the anarchist movement shift away their focus from labor and start to address issues that were harder to control and fight like the global rise in fascism and the growing communist threat. During the first twenty years of the century communist had existed in Brazil but their power was marginal as they were too removed from the masses and too authoritarian for the anarchists. In 1923, all of the communists in Latin America numbered only 50,000. In Brazil former anarchist lead by Astrogoldo Pereira formed the Partido Communista do Brasil (PCB) in 1922. Over the next decade most of the energies of both the anarchist and communist movements in Brazil went to discrediting each other. The largest issue of dispute in Brazil as well as between anarchist and communists all over the world was the uses of force and authority in the Russian Revolution. Anarchist papers like the famous A Pleb would print articles by Emma Goldman and Alexander Berkman, well known American anarchists who had been to Russia at the invitation of Lenin shortly after the Revolution. The communists would print revenge articles by Lenin denouncing Goldman and Berkman, and so in Brazil the political left eroded with bitter fights like these. The ideological dispute put off workers from joining the PCB and all during the 1920s their movement lacked the support of the working class. The anarchists were right to concern themselves with the spread of fascism but unfortunately for them they lacked the power to do anything to halt it. Fascism rose in Brazil just as it did all over the world in direct response to the global depression. Brazilian nationalism was appearing in organizations like to Brazilian Intergralist movement which was based in Sao Paulo and sputtered the motto 'God, Fatherland, and Family'. The change from a radical libertarian majority in politics and labor to an authoritarian majority was a slow process that took the entire 1920s to slowly unfold. At the same time labor was shrinking in power and influence an eager politician Getulio Getulio Vargas (1930-1945) was making a bid to come to power. In 1930, union membership for all of Brazil was only at 220,000 with a fraction belonging to anarchist (2,000) and communists (4,000) sponsored unions. In 1935, one last attempt at uniting the parties of the left in Brazil took place. The Alianca Nacional Libertadora was founded in 1935 and had four months of incredible growth until it was banned by the Vargas administration. Even with unionized labor being such a minority in a country of 30 million politicians like Vargas knew the importance of controlling urban Brazil. These few workers produced more wealth with their labor then millions of rural Brazilians. One company in Sao Paulo in 1932, paid more taxes to the federal government that 15 of Brazil's rural states. The government was supportive of unions it could control. When Confederacao Operaria Catolica (Catholic Action) was founded in 1933 it had the full support of the government. These Catholic Action groups were supported in a number of dioceses but never really gathered any enthusiasm among the church's hierarchy. Another Catholic organization named the Workers Circle tried to organize workers but made very small membership and it lacked the full approval of the Catholic Church. Vargas came to power in 1930 after he declared that the election he had just lost for president was fixed. Almost immediately after taking power he attacked the Brazilian left. Vargas closed down labor publications, arrested 600 labor leaders and prohibited strikes and meetings and demonstrations. Throughout his time in office Vargas had a perennial fear of the PCB in Brazil as they were in constant contact with Moscow. Vargas used this as an excuse to restrict foreign memberships in unions and to denounce communism as a 'exotic ideology' and a ' non-Brazilian doctrine'. This fear unfolded and on January 31, 1931 Vargas ordered all communists arrested and their property seized. Anarchists were less of a threat as they had no national power behind them as the Moscow backed the PCB. Estado Nova (New State) was the program Vargas implemented when he implemented a complete take over of the Brazilian government in 1937 but in reality it was a slow progress and not an over-night rebellion. The Unionization Law of March, 19 1931 or Decree 19,770 legalized trade unions but provided tutelage for the unions. Vargas, wanted to implement control over his unions in the same way the Mussolini in Italy had dealt with his anarchist and communists by making the unions there legal and controlling them. By 1934, the Ministry of Labor was suppose to attend all union meeting to monitor them; and the state only recognized one union for every industry of workers. Finally on September 30, 1937 the Brazilian army claimed they discovered a 'Cohen Plan' for a communist revolution in Brazil. Vargas's reaction was to cancel the upcoming presidential election and with the help of the military complete his blood-less take over of Brazil. On November 10, 1937 Vargas officially announced Estado Novo a new constitution based on corporatist and fascist ideas. The Vargas government dissolved national, state and city councils and banned any thing close to union activity as 'anti-social and harmful'. Vargas's Estado Novo was not a quick development but a long gradual process in which Vargas was very interested in promoting industrialization and proving to major American investors like Standard Oil and the United States Steel Corporation that Brazil was a stable place. This truly was a fascist takeover of Brazil as Italy and Germany congratulated Vargas on his success and photographs of Brazil's new leader where mandated in all public places. Anarchists in Brazil now had to struggle for breath. Their daily mission was simply to maintain their freedom and keep their passionate struggle alive. Many a jaded anarchist decided to leave Brazil like Oreste Ristori, who left to fight in the massive anarchist revolution in Spain. Ristori kept on fighting in Europe just as he spent a lifetime promoting the anarchist cause in Brazil, he was finally shot to death by the Germans as a member of the Italian resistance in 1944. In a span of forty years anarcho-syndicalism in Brazil had come full circle. What had started out as a small movement of anarchists who took an interest in organized labor ended up just as it had started: a small determined segment of Brazil's population. Anarcho-syndicalism is important to the history of organized labor in Brazil because it represented the position of a whole generation of Brazilian immigrants. It displayed through dramatic events like the general strikes of 1917 that Brazil's working class had the capacity to organize themselves without coercion, without authority, outside of the capitalist system. The failed revolt of 1918 is important because if it succeeded (if only for a short while) it would have been the Paris Commune or Spanish Civil War of South America. At that point in 1918 the working class population of Brazil had no love of the government or the employers and riding the success of 1917 the anarchists might have taken power. The results of the attempted revolt of 1918 was the political repression that deported most of the anarchist leadership of the syndicalism unions. The result of years of political repression is a movement in 1919 that was missing many of the key players in the 1917 general strike. The failed general strikes in 1919 signaled the end of massive anarcho-synicalist unions and the start of a more repressive political state in Brazil. Passionate Brazil experienced the full spectrum of modern political diversity in the first four decades of the 20th century. The sad result of one of South America's greatest organized labor achievements was the rise fascism in Brazil and the rule of Vargas. In 1999, anarcho-syndicalism is alive in Brazil. The C.O.B. still keeps an active voice in national and international politics. The rebirth was a result of the massive wildcat strikes on the Brazilian waterfront in the mid-1980s. In 1988, the C.O.B. aligned itself with the International Workingman’s Association (IWA). The IWA today is the world’s largest anarcho-sydicalist organization with chapters in many countries and the Brazilian C.O.B. plays an active role within that organization. a ringing cry against slavery. dreamed of a universal redemption. and the rubble of the rebels on the barricades. Anarchism- A philosophy of resistance to, and criticism of, all statist laws and authoritarianism; the theory that all forms of government rest on violence, and are therefore wrong and harmful, as well as unnecessary. (For the record the anarchist of Brazil during this time would not associate anarchism with any form of violence). It is important to note that in Brazil at this time not all anarchists were supporters of the labor movement. Some strongly criticized the anarchist role in labor unions as reformative and not revolutionary. There are a number of forms of anarchism that are neither communist or syndicalist in nature. In Brazil at this time the only other factions were individualist and mutualists. An example of an individualist-anarchist would be Max Stirner in Germany or Henry David Thoreau in America. A famous mutualist would be Pierre-Joseph Proudhon. Syndicalism- A theory of economy that advocates worker-controlled unions controlling the means of production in loosely connected associations. Reform Syndicalist were not numerous in Brazil but they were in some countries like Italy. A reform syndicalist would advocate that workers take over the means of production through reform within the existing political system. Socialism- In this time and region of the world, socialism was used as a common term for anyone who opposed capitalism and tried to organize a world without it. Both anarchists and communists considered themselves socialists. Anarchists were not reform socialists but rather 'libertarian socialists', which is a term still used today by some factions of the anarchist movement. Communism- Communists were party socialists who backed highly-organized and authoritative socialist organizations. In Brazil communists were closely connected with the USSR, and followed a similar political agenda. Anarcho-Syndicalism- Anarcho-syndicalism is the vision of a worker controlled economy free from the authority of government and the ruling class. Anarcho-syndicalism is organized along industry rather than by trade. Anarcho-syndicalism maintains that economic and social monopolies must be replaced by free, self-managed federations of agriculture and industrial workers united in a system of councils. Anarcho-Communism- Although rare in Brazil, anarcho-communists advocate a direct path to the pure communism at the end of the communist revolution. The PCB communists advocate a communist state where in theory, a communist government is established in order to destroy itself and slowly erode away and dissolve. Anarcho-communist advocates disagree with the traditional communist claim that a strong communists state is needed, they advocate a direct path to the pure communism that Marx spoke of. To summarize they agree with the traditional PCB communists on the end result of a communist revolution they just disagree on the methods used to achieve those ends. General Strike- One of the most important tools in the anarcho-syndicalist revolution. The general strike is used to halt industry and the economy while the transition to a libertarian and socialist economy could be set up. Libertarian- Before the 1950s libertarian was synonymous with anarchism. This word is used in the anarchist sense and has no connection to the bourgeois laissez faire libertarian party of modern times and their capitalist agenda. Direct Action- As opposed to the lengthy process of conventional political action, direct action promotes action without government interference. Scab- A scab is someone who crosses a picket line and replaces the labor of workers on strike. Alba, Victor. Politics and the Labor Movement in Latin America Stanford, Californian: Stanford University Press, 1968. This is a massive work on the politics of labor in South America. This book contains excellent information on South American anarcho-syndicalism and has a chapter on anarcho-syndicalism in Brazil. Arvich, Paul. Anarchist Portraits. Princeton, New Jersey: Princeton University Press, 1988. Paul Avrich is foremost English-language expert on anarchism in America. This book contains a chapter that outlines general anarchist activity in Brazil. Bookchin, Murray. The Spanish Anarchists: The Heroic Years 1868-1936. San Francisco, California, AK Press, 1998. Murray Bookchin's history of the Spanish Civil War provided some information for comparisons between anarcho-syndicalism in Brazil and Spain as well as information on the famous educator Francis Ferrer. Butler, Kim D. Freedoms Given Freedoms Won: Afro-Brazilians in Post-Abolition Sao Paulo and Salvador. New Brunswick, New Jersey: Rutgers University Press, 1998. This work provided for the examples of conflict between Afro-Brazilian and Brazilian Immigrant workers. Chilcote, Ronald H. Brazil and Its Radical Left: An Annotated Bibliography on The Communist Movement and the Rise of Marxism, 1922-1972. Mildwood, New York: Kraus International Publications,1980. This is a mainly a reference book but its introductory essay provided some information for this report. Dolgoff, Sam. " Revolutionary Unionism in Brazil Today: The COB " ­ Libertarian Labor Review. #6: 23-26, Winter 1989. This is an interview of Leonardo Morelli of the present day COB. The interview was conducted by the French anarchist weekly Le Mondo Libertaire and translated by Sam Dolgoff. The information in this article was only used to summarize the conclusion of the paper. Dulles, John W. F. Anarchists and Communists in Brazil, 1900-1935. Austin, Texas: University of Texas Press, 1973. John Dulles is one of leading Brazilian historians in America. This work serves as one of the main sources for this report. Dulles, John W.F. Vargas of Brazil: A Political Biography. Austin, Texas: University of Texas Press, 1967. This biography of Vargas was used as a source for information on Estado Novo which is an important element in this paper. Fausto, Boris. A Concise History of Brazil. New York: Cambridge University Press, 1999. This survey of Brazil was used for background information on general Brazilian history. Paulo. Chapel Hill, North Carolina: The University of North Carolina Press, 1992. The area directly around Sao Paulo and its labor history was the theme for this book. This detailed work provided much information that related directly to Sao Paulo and its anarcho-syndicalist labor movement. Gordon, Eric Arthur. Anarchism in Brazil: Theory and Practice, 1890-1920. Dissertation. Tulane University, 1978. This dissertation was one of the main sources for this report. This concise history of Brazilian anarchism provided much of the information about anarchism that is not directly related to anarcho-syndicalism. Hall, Michael McDonald. The Origins of Mass Immigration in Brazil, 1871-1914. Dissertation: Columbia University, 1969. This dissertation was only cited once in the form of a statistic. Herman, Donald L. The Communist Tide in Latin America: A selected Treatment. Austin Texas: The University of Texas, 1973. Only information that related to South American Communism and Brazil was selected from this book. It is not a main source. Howowitz, Irving Louis. Revolution in Brazil: Politics and Society in a Developing Nation. New York: E.P. Dutton & CO., INC., 1964. The theme of this book was revolutions and conflicts in mid-twentieth century Brazil nut the introductory essay provided some information for this paper. International Workers Association. " Principles of Revolutionary Syndicalism." Anarcho-Syndicalist Review. Number 25, Pg., 2, 1999. This article only contributed to the official definition of syndicalism in the glossary section of the paper. Kadt, Emanuel de. Catholic Radicals in Brazil. London: Oxford University Press, 1970. This book provided information about Catholic worker groups in Brazil as well as a general history of Brazil. Levine, Robert M. Father of the Poor? Vargas and His Era. New York: Cambridge University Press, 1998. More details about Vargas' rise to power and Brazil in the 1920's. Maram, Sheldon L. " Labor and the Left in Brazil, 1890-1921: A Movement Aborted." Hispanic American Historical Review. 57:2 (1977) 254-273. This article provides information not in Maram's dissertation. Maram, Sheldon L. Anarchists, Immigrants, and the Brazilian Labor Movement, 1890-1920. Dissertation: University of California Santa Barbara, 1972. This is the book that is cited the most in this report. This book specifically details the role of anarchist-immigrants in the development of the Brazilian labor movement. Skidmore, Thomas E. " Workers and Soldiers: Urban Labor Movements and Elite Response in Twentieth-Century Lain America." Elites, Masses, and Modernization in Latin America 1850-1930 Austin Texas: The University of Texas Press, 1979. Skidmore, like Dulles is a major Brazilian historian in America. This essay deals directly with the development of organized labor in Brazil and often referring to the anarchist influence on labor. Skidmore, Thomas E. Brazil Five Centuries of Change. New York: Oxford University Press, 1999. A general history of Brazil which was used in this report to provide a general background to the labor movement in Brazil. Simon, Fanny S. " Anarchism and Anarcho-Syndicalism in South America." Hispanic American Historical Review. February (1946): 38-59. A very compressive survey of Latin American anarcho-syndicalism with only a section on Brazil. Spalding, Hobart A. Jr. Organized Labor in Latin America: Historical Case Studies of Urban Workers in Dependent Societies. New York: Harper Torchbooks, 1977. A historical work that focuses on industrial labors in organized labor. This book provided very few examples of the anarchist influence on Brazilian labor, but did provide information about both topics separately. Troncoso, Maoise`s Poblete & Ben G. Burnett. The Rise of the Latin American Labor Movement. New York: Bookman Associates, 1960. A broad survey of Latin American labor with only a small section on Brazil. Wolfe, Jon. " Anarchist Ideology, Worker Practice: The 1917 General Strike and the Formation of Sao Paulo's Working Class. " Hispanic American Historical Review 71:4 (1991): 809-846. A very opinionated and detailed article that focuses on the role on women in the 1917 general strike in Sao Paulo. Jon Wolfe makes a very clear stand against romanticizing the Brazilian anarchists and holding those anarchists to modern anarchist moral standards (positions such as sexism and racism). His thesis is attacked by Jon D. French in a response in the same issue of the Hispanic American Historical Review. Woodworth, Fred. "Definition Of Anarchism". The Match, Pg,1, Number 94, 1999. This source was used to provide a clear definition of anarchism for the glossary. Written in 1999. A large number of corrections for spelling and grammar have been made by libcom.org. 1. Gordon, 287. While the original text contained over 100 footnotes, unfortunately the text of all the other footnotes was missing, and this was the only footnote visible.